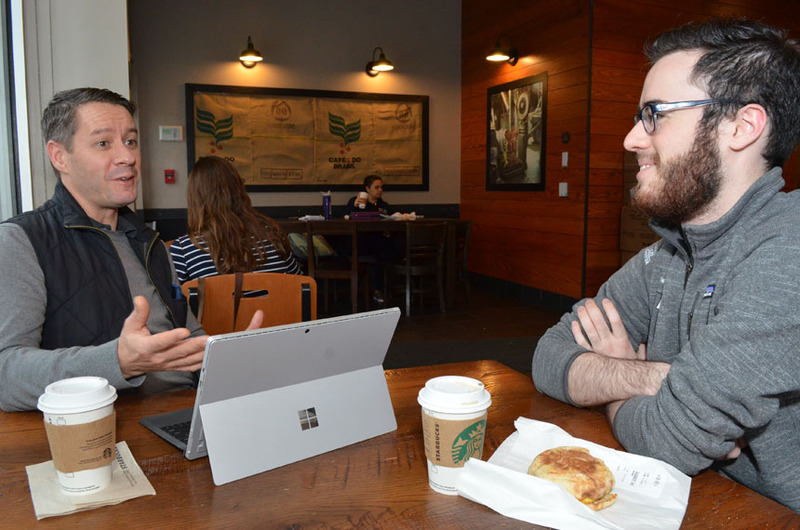 Neil Anderson ’07 (PhD optics), at left, shares career advice with Jason Tiemer ’19, an optics major, at Starbucks across from College Town. Anderson, director of strategic marketing at IDEX Scientific Fluidics and Optics, volunteers as a Real Reader for the WRT273: Communicating Your Professional Identity class, which is now required of Hajim engineering students. Anderson’s feedback on the resumes and other material Tiemer prepares for his portfolio -- and on Tiemer’s communication skills -- are an important part of the class. Aaron Swerdlow-Freed ‘15 says the insights he received as a student from a Real Reader were critical to his subsequent career. Lisa Bobich ‘04 wishes she could have benefited from a similar experience. Both are now Real Readers themselves. They among 105 professional engineer alumni who have volunteered their time this semester to give Hajim School students “real world” feedback on the resumes, cover letters, LinkedIn profiles, and other items they prepare for their portfolios as part of WRT 273: Communicating Your Professional Identity. The 2-credit course, required of all engineering undergraduates in ABET-accredited departments -- and highly recommended for computer science undergrads -- is taught by a group of writing faculty and Greene Center career advisers trained by the Writing, Speaking, and Argument Program. However, feedback from Real Readers is factored in as 10 percent of the grade students receive. “Their input is really important because it provides extra motivation for the students; it makes it real for them that when you go out into the job market, this is the kind of feedback you’ll be getting,” says Deborah Rossen-Knill, director of the WSAP. Bobich says she’s surprised that other universities aren’t replicating the Rochester model. Former Hajim School dean Rob Clark, the University’s current provost, provided the impetus that led to the launch of WRT 273 classes for engineering students in 2013. He had heard repeated comments from CEOs – many of them University alumni – that college graduates across the board, accustomed to communicating by text and other digital formats, often struggle to present themselves professionally when applying for internships and jobs. The WRT 273 requirement, he reasoned, would give Hajim students an advantage, especially if it included feedback from Read Readers. The course, designed and implemented by WSAP in collaboration with the Gwen M. Greene Center for Career Education and Connections, was phased in as a requirement for engineering students starting with the class of 2018. As a result, WSAP needs a regular supply of volunteers willing to serve as Real Readers. Last spring 148 Real Readers worked with 252 students enrolled in WRT273 class sections; at least that many students, it is anticipated, will be enrolled next spring. The departments of biology, psychology, mathematics and political science and international relations have also made real readers available as part of their WRT classes. Another section is available for students of any major. There are three required and one optional point of contact between a reader and a student. About a week after the course begins, students log into a database of Real Reader bios to choose the reader they would like to work with. Readers are notified by email, but it is up to the student to send a networking note requesting a conversation via phone, Skype, or in person. This initial informational interview, lasting 30 minutes to an hour, allows students to practice professional communication skills as they ask about the reader’s own career path, education, and current work, and ask for tips and advice. After the conversation, readers provide feedback and suggestions on how the conversation went. At mid semester, readers download and review resumes, CVs, cover letters, and application essays students have written for specific audiences. Readers respond to questions students submit with their work and have the option to comment on the material. Over the next few weeks, students work on elevator pitches, written project abstracts, interviewing skills, and LinkedIn profiles, and continue to revise their application materials. Students are encouraged at this point to request additional reader assistance. Near the end of the semester, readers download and review their students’ final portfolios. They are asked to rate the students’ communications skills and professionalism by answering two questions: On a scale of one to five, would you likely refer this student to your network of contacts based on the quality of the materials in the portfolio, and also on student’s professional behavior? The total time commitment involved in being a Real Reader varies. It depends on how many students a reader is mentoring (that’s up to the reader; some mentor as many as five students at a time, though first-time readers are encouraged to mentor only one, says Jones). It also depends on the extent to which students request additional assistance. The WSAP has Real Reader training videos available. It has also set up a channel on Slack for Real Readers to communicate with each other. Swerdlow-Freed, now an enterprise account executive at Macedon Technologies in Herndon, VA, says the real reader component of WRT 273 had fewer points of contact between readers and students when he took the course as a computer science undergraduate. Nonetheless, his real reader – a solutions engineer – made a “very positive impression” on him. In the course of his studies, Swerdlow-Freed became interested in not only the technical skills involved in computer science, but in learning how to communicate his work to a general audience. His Real Reader, he discovered, was doing exactly that in his job – working directly with prospective clients to help them understand the software they were buying, and how it worked. Bobich went on to earn master’s and PhD degrees in bioengineering at Arizona State University after completing her BS in biomedical engineering at Rochester. She’s now a principal product engineer and sourcing engineering process coordinator for Medtronic in Tempe. Five years ago, Laura Jones emailed her about the Real Reader program. She rarely limits the initial informational interview to the recommended 30 minutes.